“I went into nuclear cardiology by accident. I was influenced by a very good physicist, Norman Dean, who was known as the father of European nuclear medicine, to such an extent that I even went and did a masters in nuclear medicine part time to better understand the subject. I never looked back. “Nuclear cardiology is the use of radioisotopes as a diagnostic tool; isotopes are tagged to different agents that are carried to cardiac cells, to assess function and coronary disease. Nuclear imaging has a wide range of applications with perfusion tracers such as thallium and technetium-99m. Future applications include radiolabelled antibodies for apoptosis and plaque burden estimation. “Nuclear cardiology has developed a lot since I started, and has now found its niche. With much validated data it is now part of NICE [National Institute for Health and Clinical Excellence] guidelines, which are strongly in its favour. Although few high volume specialist centres are undertaking such non-invasive imaging at present this is definitely set to increase, as patients with suspected coronary disease, diabetes, and metabolic syndrome increase in developing as well as developed countries. Pictured right: Coloured single photon emission computed tomography. “I am training in nuclear cardiology, alongside complementary imaging techniques such as echocardiography, cardiac computed tomography, and MRI [magnetic resonance imaging]. I think it is an excellent diagnostic tool because it can be used for virtually any patient. In comparison, computed tomography requires a relative bradycardia and echocardiography can be operator dependent. There is a quick turnover and the procedure is non-invasive compared with x ray angiography. “At present there are three training pathways (in no particular order): (1) cardiology subspecialising in cardiac imaging (focusing on nuclear cardiology); (2) nuclear medicine (focusing on nuclear cardiology); (3) radiology subspecialising in radionuclide radiology (focusing on nuclear cardiology). 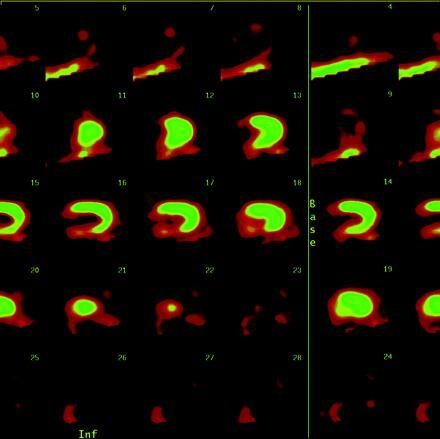 “Jobs involving nuclear imaging are likely to increase; however, stand alone nuclear cardiology posts are limited, so it is probably best to undergo imaging training with an interest in nuclear cardiology.